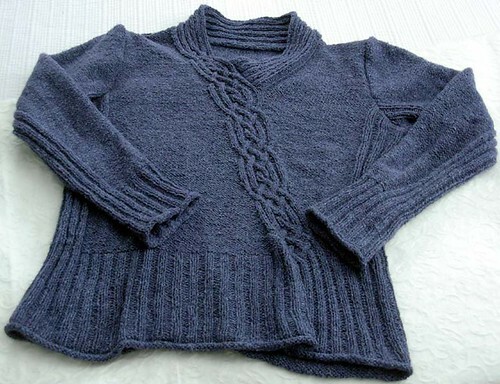 I’m almost ashamed to admit what a bad blogger I’ve been–I’ve had my Braided Pullover finished for nearly (over?) two weeks, I’ve even worn it twice so far–but I’m only just now getting it posted here. Sigh. Must work on prompter posting. Modifications: I reworked the decrease rate after discovering that an “off” row gauge + my lack of height made the v-neck too low. Also shortened sleeves. 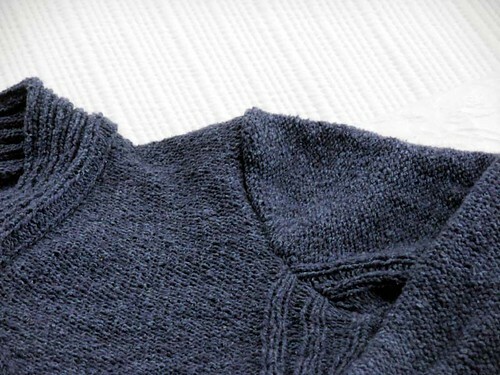 Verdict: Not a big fan of Silky Wool for reverse stockinette stitch, which is the bulk of the sweater. I think that a more “smooth” (technical term, ahem) yarn would make a more even field. This shows off my inconsistent tension just a mite too much. (So I’m admitting the failing isn’t just the yarn!) Otherwise, it’s not a bad yarn. I’m also not a 100% fan of my own re-work math. Either I miscalculated the decrease rate, forgot to account for the neck band, or my row gauge changed between calculations and knitting, but the neck ended up higher than anticipated on the second go-round. I’m leaving it, however. I’ve already knit this twice, and it should be warmer this way. Necessary this winter, I might add. Finally, as seen below, the seam joining sleeves to body is a little puffy, a look I’m not excited by. I should have realized this from the pattern pictures, but I must have overlooked it. What’s really puzzling me though, is I swear I didn’t have this problem the first go-round and I know I didn’t change anything about the sleeve or shoulder decreases. In the final conclusion, it’s warm, comfy, and the little things won’t bother me enough to not wear it. I just might avoid my own math for future projects! It’s a lovely sweater and color. You did a beautiful job! The sweater looks really warm and comfortable, and I love the braided cable across the front. Hopefully all the details will bug you less as you wear it (I find that often happens when I’m being picky about my own work). The yarn might not have been fun to work with, but it makes a beautiful sweater!